ready to take the next step in their careers and reach the top tier of the marketing world. an innovative program that combines managerial expertise with the latest topics in digital marketing. high-level executives and Chief Marketing Officers at leading companies around the world. The world of advertising and marketing is experiencing a digital revolution, and companies in every industry are quickly becoming aware of how important it is to listen to the customer. What’s more, they must use the information gathered to drive engaging, creative and cohesive campaigns that are seamless and effective—no matter the channel or medium. Now more than ever, the digital marketing industry needs leaders who can guide businesses through this exciting time; drive innovation in products and services; and build globally successful strategies and campaigns. This Dual Degree aims to shape ambitious professionals in the business and marketing worlds into the versatile and innovative leaders of tomorrow. By combining the International MBA—IE Business School’s flagship full-time program—with the Master in Digital Marketing from IE School of Human Sciences and Technology, students will graduate with both the advanced management skills and marketing expertise they need to reach the top. If you choose to join them, you’ll be challenged to use both the right and left sides of the brain, exploring how to respond creatively to each brand’s needs and aspirations while learning to effectively lead teams and manage client relationships. You’ll be taught by the best, and have the chance to interact with other leading professionals in your field to weave an impressive network of contacts. In short, this program will prepare you to go out into the world and make big things happen not only for brands and businesses, but for your own career. Want to receive more information about this Dual Degree? Students will acquire two official degrees. They must fulfill the requirements listed here to be issued an Official University Degree upon completion of each master’s program. The Master in Digital Marketing is a University Private Degree from IE University,* taught at IE School of Human Sciences and Technology. University Private Degrees are earned by completing cutting-edge programs that focus on the practical applications of theoretical studies. 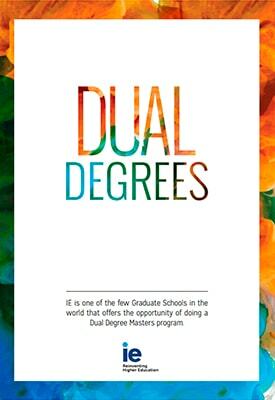 Although they do not qualify students for doctorate programs, these degrees impart the pragmatism and expertise needed to build a successful career, and reflect the entirety of IE University’s rigor and prestige. *IE University is officially recognized by the Spanish education authorities. It grants both Official University Degrees (bachelor’s, master’s and PhD programs, which are regulated and accredited by the Spanish Ministry of Education) and University Private Degrees (master’s programs). This dual degree is a combination of the two following programs. Explore their websites for more details. As the demand for digital marketing savvy increases, 64% of recruiters report there is a shortage of skilled marketing professionals. Would you like to know more? Or just get in touch? We'd love to hear from you!